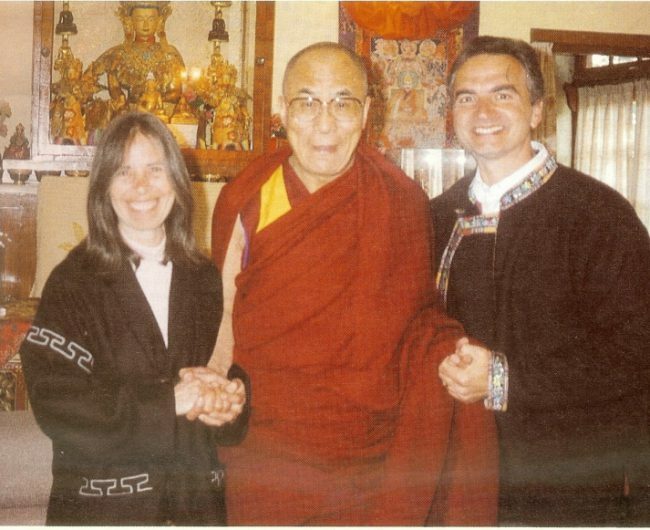 On February 18, 1994, Sita and I were blessed to spend a full hour with His Holiness the Dalai Lama at his home in Dharamsala, India. We arrived right in the middle of Losar, the Tibetan New Year when 10,000 people lined up to receive a personal New Year’s blessing from the Dalai Lama. 10,000 people, and he did, indeed, patiently greet each one with love and respect. My religion is very simple; my religion is kindness. During our private meeting, the Dalai Lama wanted to hear our descriptions of prison life and the general prison situation. He was deeply interested and moved by what we told him. He asked me three different times whether I was promoting any particular religion. He made it very clear that it is more important to create a safer, kinder world than it is to recruit more Buddhists or Christians or Muslims, etc. His Holiness offered his blessings and support of our work and encouraged me to work more with prison staff. He emphasized that the hostility and negativity of prison life will not change until both staff and inmates change their attitudes toward each other. I admitted that I have not made enough of an effort to offer talks and workshops to correctional officers and other staff, and I promised to correct this immediately. I also said I would give more public talks about the futility of building so many prisons instead of finding kinder solutions to crime and drug abuse. On his part, he made tentative commitments to write a foreword for the next reprinting of We’re All Doing Time, and to include our office here in North Carolina as a stop on his 1995 visit to America. But even more, I think prisoners and prison problems are in his heart now in a more informed way than before, and many good things will result from that. Certainly, Sita and I were deeply re-inspired by his example. Here is someone who has given up selfish living entirely and dedicated himself to the welfare of all beings; and the result is a presence of freedom, peace and joy so strong that he can hardly say 10 words without laughing. Living solely for the benefit of others, he is happier than anyone else we’ve ever met. With more demands on his time than we can ever imagine, he moves through his busy day with simplicity, humility and gracefulness. He is worshipped as a living God by Buddhists, yet truly considers himself a simple monk. And every one of us has the opportunity to discover the same peace and freedom which he has discovered. Every one of us can let go of illusions and projections and the constant fantasy of self-protection, and relax into the Eternal Truth of our real nature, just as he has. There isn’t a “realer” pursuit in the world. 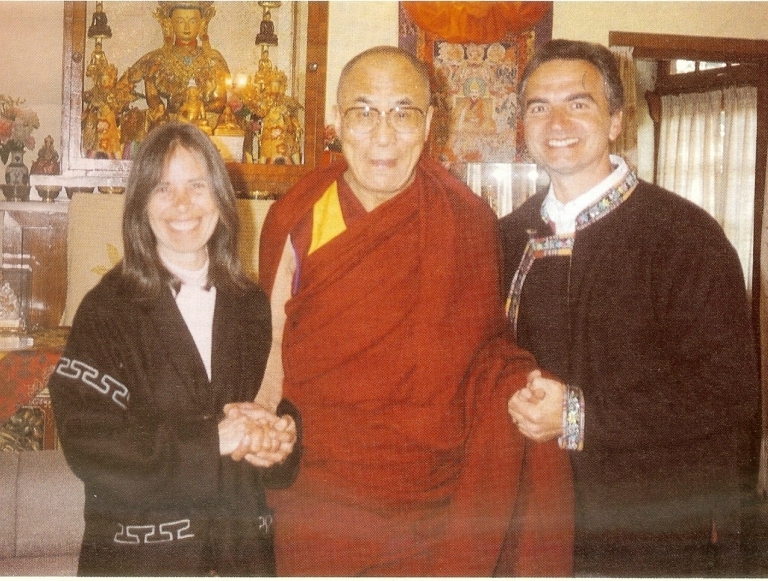 Spending time with the Dalai Lama was a comforting reminder to me and Sita that a balance of spiritual practice and lovingkindness holds more promise than any other lifestyle during this difficult age. Sita and I pledge to rededicate our lives to the simplest classic spiritual ideals, and we encourage you to do the same. For those of you who don’t know much about the Dalai Lama or the Tibetan situation, here’s an extremely brief description: Tibet sits atop the majestic Himalayan Mountains between China and India. For many centuries, Tibetan life revolved mostly around studying and practicing the Buddha’s deepest teachings, under the guidance of each Dalai Lama. You see, each time the Dalai Lama dies, he leaves clues as to where or when he will take birth again. Within a few years after his death, Tibet’s sages also have dreams and visions which give further clues, and then they go in search of the new incarnation. When the infant or toddler is found, he is tested in various ways, including a ceremony in which he must identify various religious relics from his former life and correctly reject the imitations and forgeries of those relics. When the sages are satisfied of his identity, the infant’s parents gladly entrust him to a monastery, to be educated and trained by Tibet’s wisest, most compassionate teachers, and groomed for his eventual role as leader of the Tibetan people. Of course, being an incarnation of an enlightened master, the child often knows scriptures and teachings even before hearing them. Between such natural abilities and the extraordinary attention paid to his training, he becomes intelligent and insightful almost beyond imagination. The current Dalai Lama can sit for hours in profound peace or discuss quantum physics with the world’s most renowned scientists; he can give the most ancient and sacred Buddhist initiations or speak to the U.S. Congress about subtle details of foreign policy and human rights abuses in nations like China. He has clearly transcended the chains and struggles of worldly life, yet chooses to remain fully involved in the world and 100% committed to relieving its suffering. After centuries of peaceful spiritual living, Tibet was invaded by China in the 1950’s. In 1959 — after years of trying to negotiate a peaceful settlement — the Dalai Lama was forced into exile. He and his advisors and family, like thousands of other Tibetans before and since, actually walked over the most rugged, snow-bound mountain passes in the world, hiding from Chinese soldiers all the way. Millions of Tibetans have died, either victims of the Chinese army, or casualties of frostbite, avalanches and other hazards of their journey to freedom. Sadly, this situation continues today. And although the Dalai Lama was awarded the Noble Peace Prize in 1989 for his dedication to the Tibetan cause, very few nations (including the U.S.) have lent any help at all, because China is so powerful and Tibet so obscure. So the struggle for Tibet’s freedom continues, based out of the small, mountainous village of Dharamsala, India — the Tibetan capital-in-exile.